What is Boston looking for in a new superintendent? 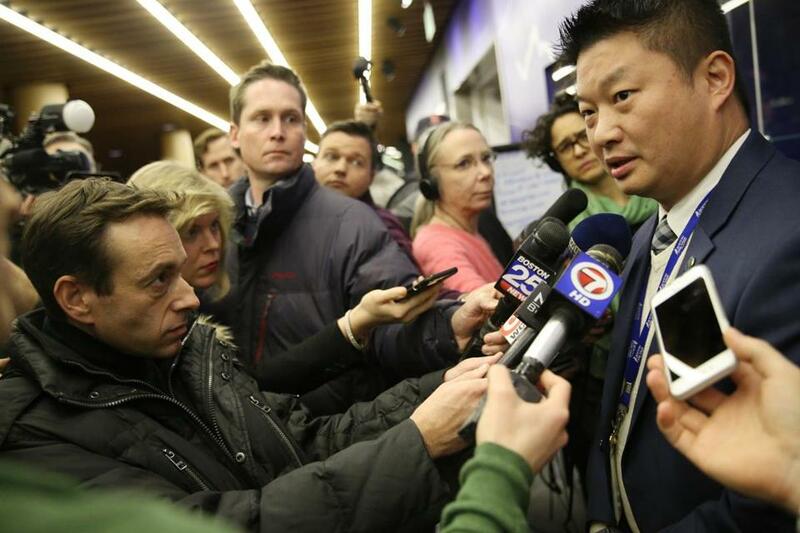 Boston school officials, staff, parents, and other interested parties are debating the qualities needed in the school superintendent who will take over from the departed Dr. Tommy Chang (at right, addressing the media before a School Committee meeting). As Boston embarks on a search for a new school superintendent, Mayor Martin J. Walsh and the Boston School Committee will wade into an age-old question: Do the Boston Public Schools need a strong business-like manager or a proven academic leader at the helm? The question has taken on greater urgency in recent years as the 55,000-student system has encountered one public uproar after another over everything from late-running school buses to dire budget cuts to deteriorating school buildings. All the while, academic performance in many schools has been declining. Just last month state education officials identified about 40 schools for targeted assistance to remedy low standardized test scores and student attendance. The cascade of troubles has added to the School Department’s reputation for bureaucratic dysfunction and has undermined public confidence. It also has raised questions about whether the search will result in finding the right leader at a time when big school systems nationwide have been struggling to attract strong superintendents. Jessica Tang, president of the Boston Teachers Union, said the ideal candidate should be both a strong manager and educator who keenly knows how policy changes affect teachers and students. “If you have one without the other, your leadership is not as effective,” said Tang, who serves on an 11-member panel appointed by the School Committee to find a new superintendent. Over the past two decades, the Boston School Committee has tended to gravitate towards superintendents with records as instructional leaders. Boston’s two most recent superintendents, Tommy Chang and Carol Johnson, fell into that camp, although each had distinct characteristics. Chang placed a focus on racial inequality and social justice, while Johnson was known to be empathetic and widely visible in the community. But both struggled at times to build community support for proposals, causing them to pull them back. Thomas Payzant, who served before both of those leaders, earned more of a reputation of being both an academic leader and solid chief executive. Payzant, who had been a longtime superintendent in San Diego and a former US assistant education secretary under president Clinton, is largely credited with making slow steady gains during his 11-year tenure. But a few initiatives ultimately failed, such as breaking the city’s large, failing comprehensive high schools into smaller schools. Neil Sullivan, president of the Boston Private Industry Council, a nonprofit that works on youth workforce development programs, said an ideal superintendent would be someone who blends the best of what Payzant, Johnson, and Chang had to offer: strong management, empathy, and social justice concerns. Jane Miller, a founder of Start Smart BPS, a parent organization that emerged out of a failed proposal last year to change school start times, said a new superintendent will face enormous challenges — from closing opportunity and achievement gaps among students to overhauling school facilities in a way that doesn’t harm students. In the coming weeks, the superintendent search committee will hold a series of community meetings to gather opinions from educators, parents, students, and other interested parties on what qualities and characteristics they would like to see in a new superintendent. The goal is to complete a job description, which would include the characteristics and qualities, by Nov. 14 and interview finalists during the winter. The panel is not starting from scratch. It likely will revise a previous job description developed four years ago when the city last sought a superintendent, which included qualities like demonstrated experience closing achievement gaps and ability to work with a diverse system of students. The panel expects to field wide opinions on what people want in a new superintendent. Those with ties to the business and nonprofit worlds are expected to push for a strong business manager. Many of these supporters remain smitten with former interim superintendent John McDonough, who served from 2013 to 2015, and implemented big changes, such as giving principals more autonomy to hire the teachers of their choosing. Pam Kocher, vice president of the Boston Municipal Research Bureau, a watchdog funded by businesses and nonprofits, has a similar take. “We do think it’s time for a strong manager,” she said. Some groups, such as the Boston Teachers Union, are proactively surveying their own members about the qualities they want in a superintendent. Tang said initial results indicate members prefer a superintendent who is local or knows Boston and who understands its history, the educational system, the neighborhoods, and the city’s politics — the latter of which can trip up even experienced school leaders. Members also desire a superintendent who has classroom experience. Educators for Excellence Boston, a nonprofit group, also has an ongoing survey of teachers. The top three characteristics emerging so far in its surveys: a leader who has classroom experience, who is effective at community engagement, and is transparent. “It’s really important to have a leader who brings the community through the process of decision-making and not just at the tail end,” said Brandy Fluker-Oakley, the group’s executive director. Tanisha Sullivan, president of the Boston chapter of the NAACP, places a stronger premium on an academic leader.